What’s up, Nomsters! 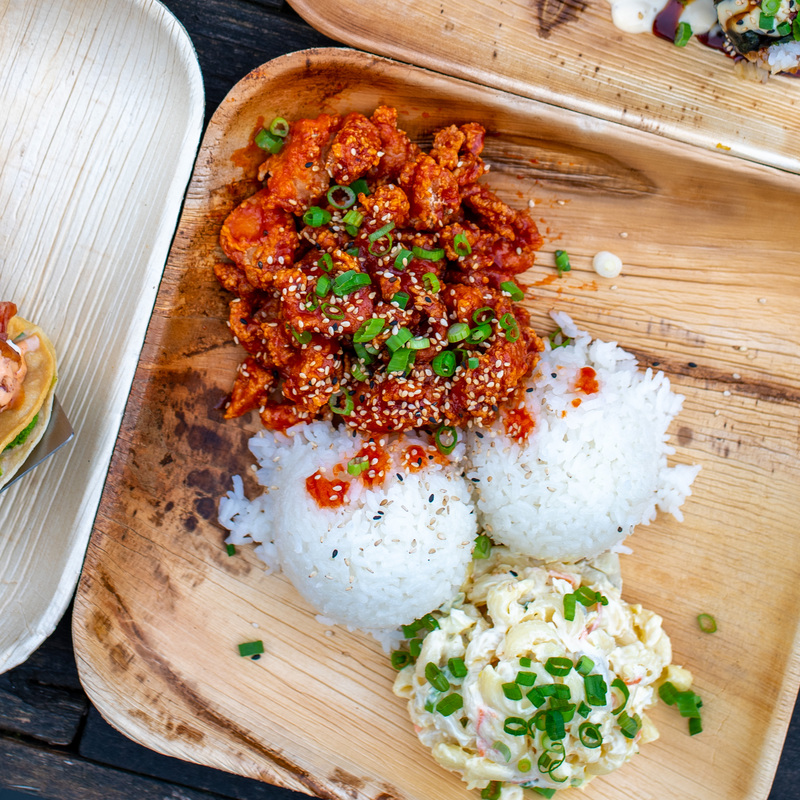 Sam Choy, the “God Father” of poke, needs no introduction, and if you’re a HUGE fan of poke and Hawaiian-influenced cuisine like we are, Sam Choy’s Poke to the Max is a must-try! I stopped in at their Seattle location while on a trip up there (keep an eye out for a Seattle restaurant round up coming soon! ), but they also have a spot in San Bruno, CA, so all you Bay Area peeps get to enjoy all the fantastic noms, too! One thing was made clear – they do SO much more than just poke! So if raw fish isn’t your thing, you’ve got plenty of delicious options and you should still grab a plate and get your grub on with them. Let’s get to the food! We decided to try some of the Sam Choy’s Poke fan favorites, which were some of the more unique dishes aside from just regular poke bowls. 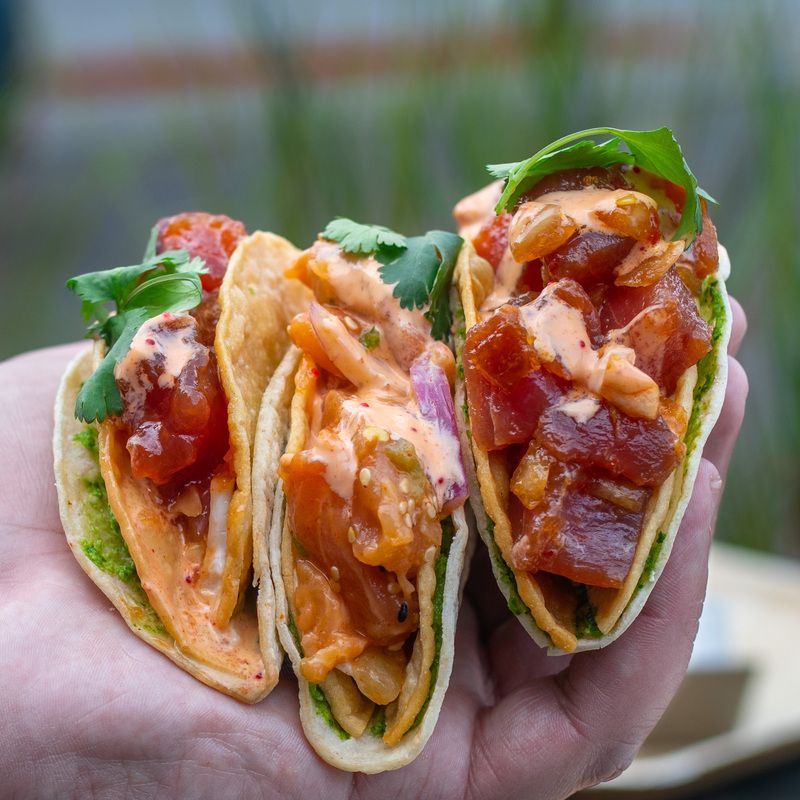 The first one was their Poke Tacos, and they were straight up fire! 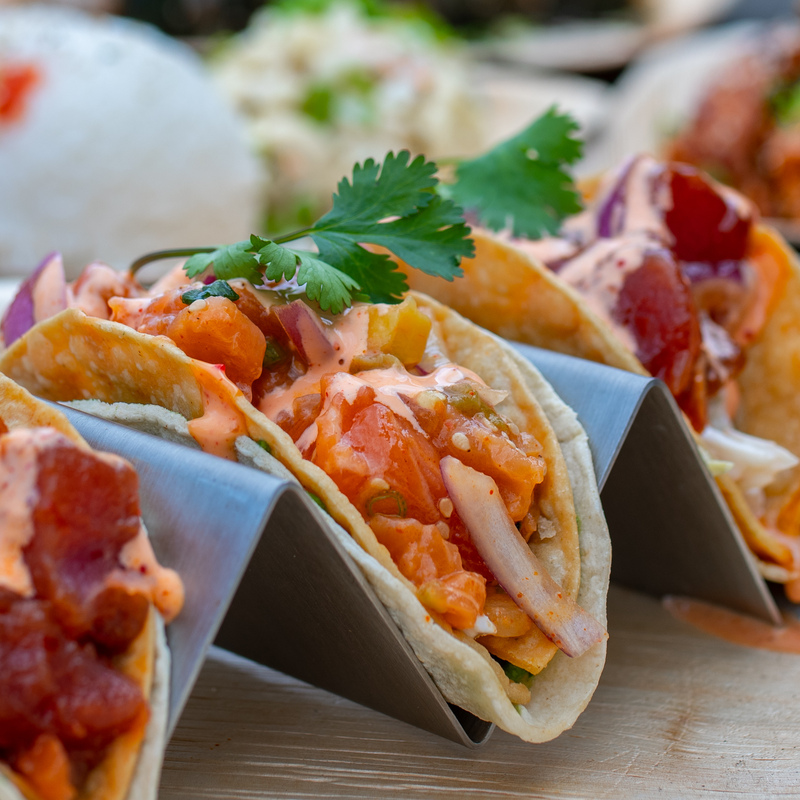 The salmon and tuna was ultra fresh and melt in your mouth – none of that chewy stuff – and it’s stuffed into a hard taco shell AND and soft taco shell with edamame hummus BETWEEN the shells, and topped with slaw and spicy aioli. Good lord, you need to try these! 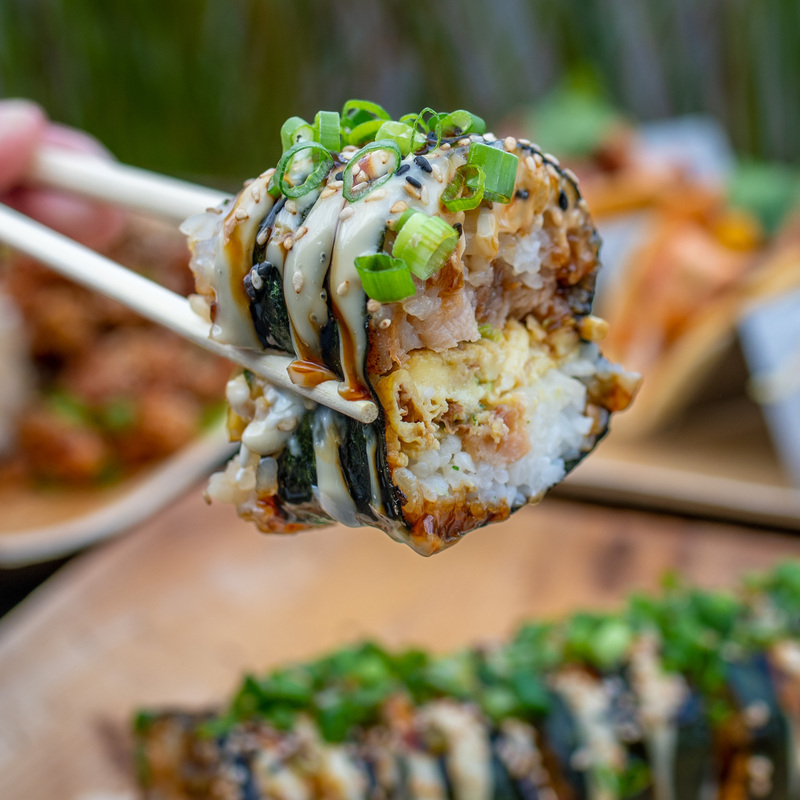 Next up from Sam Choy’s Poke to the Max was the Pork Belly Musubi! It’s got pork belly, egg frittata, aioli, and unagi sauce. I have to admit, I was a little skeptical, even given how freakin’ incredible it looks, because I have never been a fan of sushi with cooked meat or fish, but this was two thumbs waaay up. Juicy, thick pork belly and sushi were clearly meant for each other. This is a new one Sam Choy’s Poke has been testing out and are thinking about adding to the menu. The Spicy Korean Fried Chicken gets it’s flavor from a healthy heaping of gochujang, and definitely has a kick! The chicken itself is nice and moist on the inside, and crispy on the outside, and the rice and mac salad add just the right balance to the strong flavor of the chicken. I seriously hope this dish makes the cut and becomes a permanent part of the menu! There are a lot of poke places around, but not many bring the variety, quality, and flavor profiles that Sam Choy’s Poke to the Max does. And it’s not just that, but the consistency across their entire menu is really impressive. Even if you think you’re a poke connoisseur and have “tried it all” you NEED to give this stuff a try. Till next time, Nomsters! SEE ALSO: Flights of Food? Don't Mind If We Do! For more awesome Bay Area recommendations, check out our SF Bay Area tab HERE. For more Travel recommendations, check out our Travel tab HERE.